The Sun is on average 228 million km away from Mars. 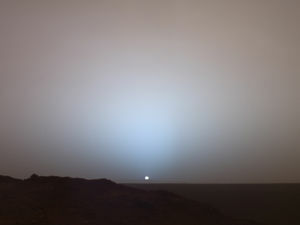 Sunlight takes 13 minutes to travel from the Sun to Mars with a power of 589 W/m2. It is not as bright as on Earth (1367 W/m2). No one has ever seen it, but it probably gives the impression of dawn or dusk during daytime. Colonists should have this impression only for a few days until their visual cortex adapts. The Martian atmosphere does not filter sunlight as efficiently as on Earth, leaving too much UV ray and high energy particles to reach the surface. Life is considered not possible without additional shielding against cosmic radiation (perhaps highlighting the need for an early warning system) and parts of the solar spectrum. The amount of usable energy on the surface is lower due to the rotation of the planet and the angle of the plain. Also, reflection and absorption (albedo) at the atmosphere must be considered. On Earth the annual usable energy per m2 is about 1000 kWh in Middle Europe and 2400 kWh in the Sahara. Sunlight can be used for power generation by solar panels and for growing plants in greenhouses. "in the UK we receive an average power of about 125 Wm-2 whilst the Sahara Desert gets 250-300 Wm-2" . With 24*365 hours per year this results in an average usable energy per m2 and year of 1095 kWh in the UK and 2190-2628 kWh in the Sahara. What are the psychological and physiological effects of the permanent dim light on humans, animals and plants? Are there scientific facts of a positive effect of artificial light to compensate the lack of sunlight? 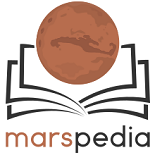 What is the annual usable energy on Mars in the equator region? This page was last edited on 17 December 2018, at 13:40.